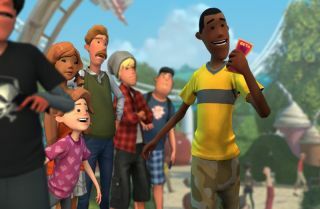 Frontier Developments announced Planet Coaster, a spiritual successor to RollerCoaster Tycoon 3 (specifically RCT3, because that's the one Frontier did) during the PC Gaming Show at E3. We haven't heard much about it since, but the game is now available for preorder. The base game can be preordered for $30/£20, or you can snag the "Early Bird Beta Pass," which includes, as you might guess, access to the beta prior to release, for $75/£50. Going beyond that, there's also a $15/£10 VIP Single Ticket, which will put you into the game as a guest of the park via the Guest Designer software, a $60/£40 VIP Group Ticket, which provides the same for a group of up to six people, the VIP Staff Pass that makes your character a permanent park staff member for $150/£100, and finally, a VIP Park Foundation Stone, which will engrave your name in a stone placed at the entrance of every park, everywhere, for $750/£500. That last offering is limited to 100 "stones," although dedicated stones for themed entrances may be added later. You'll also want to take note that the Tickets, the Staff Pass, and the Foundation Stone do not include a copy of the game. To play it, you'll need to spring for one of the two preorder options. The preorder campaign gives no indication of a release date more specific than 2016, nor of what the final release will ultimately cost; the site does state, however, that preorders are being offered at a "discounted price." Correction: The original version of this story referred to Planet Coaster's pre-order options as a form of crowdfunding. Frontier has confirmed that Planet Coaster is being developed with their own money.